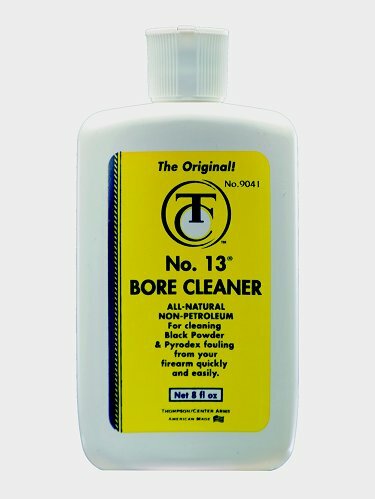 Thompson Center #13 Bore Cleaner (8 oz) is an all natural bore cleaner which contains no petroleum based additives and is compatible with Natrual Lube 1000 plus. Number 13 will quickly and efficiently remove any trace of residue or fouling without eliminating the "seasoning" which has coated the surface of the bore. For more Muzzle Loading Accessories Click Here. I don't know what this stuff is, it came recommended. I'm using Whitehots for powder, so far it's all I've used in this new smoke pole. One or another, gun cleans fast and easy using Thompson's #13, wet a rag and wipe clean the breach plug face, easier then wiping the Grandson's nose! The barrel is stainless and cleans easy using this cleaner. It's all I've used and the gun has only had 20 rounds thru it. I'm going to check it every month until next season to be sure none of that corrosion appears. So, I can recommend it based on use so far.